AMID the $6 million homes perched on a beachfront cliff in this conservative Southern California enclave, the seven-year-old Honda Civic hybrid with the Obama bumper sticker is the giveaway. It’s not the usual drive of choice for wealthy former hedge fund managers like David Gelbaum. Then again, there’s not much that is business as usual about Mr. Gelbaum, an intensely private person who happens to be one of the nation’s largest — and largely unknown — green technology investors and environmental philanthropists. Mr. Gelbaum has invested $500 million in clean-tech companies since 2002 through his Quercus Trust, amassing a portfolio of some 40 businesses involved in nearly every aspect of the emerging green economy, be it renewable energy, the smart electric grid, sustainable agriculture, electric cars or biological remediation of oil spills. He has poured almost as much into environmental causes. In this economic downturn, many venture capitalists have grown cautious about putting money into what Vinod Khosla, the prominent Silicon Valley green tech investor, calls “science experiments.” But Quercus Trust is still taking chances on blue-sky start-ups pursuing technological breakthroughs. Working outside the clubby venture capital network, Mr. Gelbaum has, until recently, maintained an obsessively low profile. In Silicon Valley, he remains something of an unknown. Associates say his near-invisibility is owed to a genuine modesty and concerns over the security of his family because of his wealth. Recipients of his philanthropy, for instance, signed confidentiality agreements that forbade mention of his name. Mr. Gelbaum says he decided to break his long silence upon becoming chief executive in February of Entech Solar, one of his portfolio companies that is publicly traded. “This is what’s best for the company,” he says, pointing out that Entech benefits if he maintains a more public profile. It is too early to predict whether Mr. Gelbaum’s big green bets will pay off. But he’s been capitalizing on two trends: the rapid decline in the price of photovoltaic power, and a focus on cutting capital costs as solar power competition with China intensifies. His environmental philanthropy also gives him an influence beyond laboratories and boardrooms. He has given $200 million to the Sierra Club and $250 million to the Wildlands Conservancy, a land trust he co-founded that has acquired and preserved 1,200 square miles of land in California, including more than a half million acres of the Mojave Desert. Bill Gross is not your typical solar energy entrepreneur. In a business dominated by Silicon Valley technologists and veterans of the fossil fuel industry, Gross is a Southern Californian who made his name in software. His Idealab startup incubator led to the creation of companies such as eToys, CitySearch, and GoTo.com. The latter pioneered search advertising — think Google — and was acquired by Yahoo for $1.6 billion in 2003. That payday has allowed Gross to pursue his green dreams. (As a teenager, he started a company to sell plans for a parabolic solar dish he had designed.) Over the past decade, Gross has launched a slew of green tech startups, including solar power plant builder eSolar, electric car company Aptera, and Energy Innovations, which is developing advanced photovoltaic technology. But it has been eSolar, backed by Google and other investors, that has been Idealab’s brightest light. In January, the company signed one of the world’s largest green-energy deals when it agreed to provide the technology to build solar farms in China that would generate 2,000 megawatts of electricity — at peak output the equivalent of two large nuclear power plants. And last week, eSolar licensed its technology to German industrial giant Ferrostaal to build solar power plants in Europe, the Middle East, and South Africa. Those deals followed eSolar partnerships in India and the U.S.
ESolar’s power plants deploy thousands of mirrors called heliostats to focus the sun’s rays on a water-filled boiler that sits atop a slender tower. The heat creates steam that drives an electricity-generating turbine. Last year, eSolar built its first project, a five-megawatt demonstration power plant, called Sierra, in the desert near Los Angeles. This “power tower” technology is not new, but what sets the company apart is Gross’ use of sophisticated software and imaging technology to control the 176,000 mirrors that form a standard, 46-megawatt eSolar power plant. That computing firepower precisely positions the mirrors to create a virtual parabola that focuses the sun on the tower. That allows the company to place small, inexpensive mirrors close together, which dramatically reduces the land needed for the power plant and cuts manufacturing and installation costs. “We use Moore’s law rather than more steel,” Gross likes to quip, referring to Intel co-founder Gordon Moore’s maxim that computing power doubles every two years. ESolar Inc. of Pasadena signed an agreement Friday to build a series of solar thermal power plants in China with a total capacity of 2,000 megawatts, in one of the largest renewable energy deals of its kind. Coming four months after an Arizona company, First Solar, secured a contract to build an equally large photovoltaic power plant in China, the ESolar deal signals China’s emergence as a major market for renewable energy. “They’re moving very fast, much faster than the state and U.S. governments are moving,” said Bill Gross, ESolar’s chairman and the founder of Idealab. Under the agreement, ESolar will provide China Shandong Penglai Electric Power Equipment Manufacturing Co. the technology and expertise to build solar “power tower” plants over the next decade. Those solar farms would generate a total of 2,000 megawatts of electricity; at peak output that would be equivalent to a large nuclear power plant. The terms of the agreement were not disclosed. The initial project, which includes a 92-megawatt solar power plant to be built this year, will be located in the 66-square-mile Yulin Energy Park in the Mongolian desert in northern China. The region has become a hot spot for renewable energy, with the 2,000-megawatt First Solar project planned 60 miles to the north. eSolar on Wednesday fired up its five-megawatt Sierra “power tower” solar farm outside Los Angeles during an opening ceremony that featured such green tech luminaries as Google.org climate change director Dan Reicher and Dan Kammen of the University of California at Berkeley. But the speaker that caught my eye was environmentalist David Myers, executive director of the Wildlands Conservancy, a Southern California non-profit that is working with California Senator Dianne Feinstein to put hundreds of thousands of acres of the Mojave Desert off limits to industrial-scale solar power plants. But eSolar’s strategy of building relatively small-scale modular solar farms on privately owned agricultural land is also allowing it to avoid — so far — fights over endangered species that have slowed big solar power plants planned for federally owned land in the Mojave Desert. While Myers was praising eSolar at the Sierra ceremony, his environmental group, as I wrote in Wednesday’s New York Times, has been raising issues about the impact of Tessera Solar’s planned 8,230-acre, 850-megawatt power plant on such Mojave species as the desert tortoise, Mojave fringe-toed lizard and Nelson’s bighorn sheep. Meanwhile, Defenders of Wildlife, a local chapter of the Sierra Club and other national and grassroots environmental groups are worried about the impact of BrightSource Energy’s 400-megawatt Ivanpah solar farm on the imperiled desert tortoise. The Sierra Club chapter recently proposed that BrightSource move the solar power plant to avoid disturbing habitat currently occupied by desert tortoises. eSolar has spent $30 million acquiring previously disturbed ag land — mostly in California. While that should speed development of its solar farms as it won’t need federal approval to build, there’s no guarantee, of course, that the Pasadena, Calif.-based startup won’t also run into critter problems. Just ask Ausra, the Silicon Valley solar company that’s building a 177-megawatt power plant on ag land in San Luis Obispo County on California’s central coast. That project has been bogged down in disputes over the solar farm’s consequences for a plethora of species and the cumulative impact of two other solar power plants planned for the same area that First Solar (FSLR) and SunPower (SPWR) want to build. Still, eSolar’s focus on location, location, location could pay off. While the five-megawatt Sierra demonstration plant is a small project, the fact that company was able to get it built in a year is no doubt a competitive advantage. And if eSolar continues to carefully select sites for its solar farms it won’t have to worry about environmentalists like David Myers of the Wildlands Conservancy. With that, Gross walked over to a computer, pressed a button and 24,000 mirrors began to focus sunlight on two water-filled boilers sitting atop two towers. As the intense heat vaporized the water, steam flowed to a power block to drive an electricity generating turbine. eSolar, the solar energy startup founded by Idealab’s Bill Gross and backed by Google, has signed a 20-year contract to supply utility Southern California Edison with 245 megawatts of green electricity. 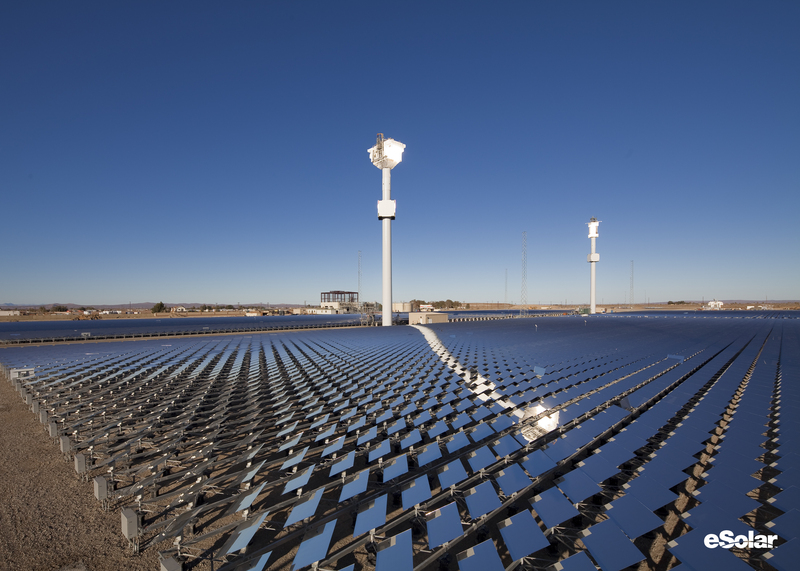 The solar power plant will be built in 35-megawatt modules, with the first phase set to go online in 2011. As Green Wombat reported in April, eSolar scored $130 million in funding from Google.org, Google’s (GOOG) philanthropic arm, and other investors to develop solar thermal technology that Gross claims will produce electricity as cheaply as coal-fired power plants. Like Ausra and BrightSource Energy – which have deals with PG&E (PCG) – eSolar will use fields of mirrors to heat water to create steam that drives electricity-generating turbines. 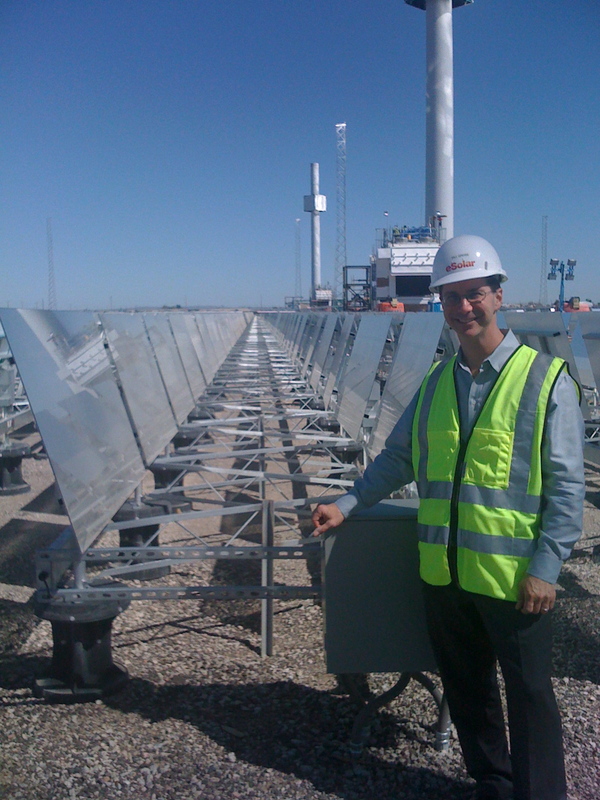 Gross says that eSolar’s software allows the company to individually control smaller sun-tracking mirrors – called heliostats – which can be cheaply manufactured and which are more efficient and take up less land than conventional mirrors. According to Gross, that means eSolar can build modular power plants near urban areas and transmission lines rather than out in the desert, lowering costs. eSolar is keeping mum about the exact location of the power plant, only saying it will be in the Antelope Valley region of Southern California. One potential hitch: Getting eSolar’s electricity to Southern California Edison will depend on the construction of a major new transmission line. That line, the Tehachapi Renewable Transmission Project, has been partially approved to date. With the eSolar deal, the utility is hedging its bets. Back in 2005, Southern California Edison signed a highly publicized deal with Phoenix’s Stirling Energy Systems to buy up to 850 megawatts of solar electricity from massive solar power plants to be built in the Mojave Desert. (Around the same time, San Diego Gas & Electric (SRE) signed a power purchase agreement with Stirling for up to 900 megawatts. ) Stirling is still perfecting its technology and has yet to file a license application for its first plant. But the company received a $100 million investment earlier this year and Hemphill says Stirling is moving forward. The souring economy hasn’t dissuaded green tech investors from making big bets on renewable energy. On Wednesday, solar power plant builder BrightSource Energy announced it had raised $115 million from a group of investors that include Google.org, the search giant’s philanthropic arm, and oil giants Chevron and BP. The investment in the Oakland, Calif.-based startup is Google’s (GOOG) second big solar energy play in the past two months. In April, Google.org joined a $130 million round for eSolar, a Pasadena solar power plant company whose chairman is Idealab founder Bill Gross. Given that a 500-megawatt solar power plant can cost more than $1 billion to build, $115 million is but a drop in the bucket. But it will allow BrightSource, which previously raised $45 million, to proceed with the development of its technology as it seeks project financing for construction of its first power plants. And it can’t hurt to have such high-profile backers when you negotiate power purchase agreements with utilities. Besides Google, BP Alternative Energy (BP) and Chevron Technology Ventures (CVX), previous investors participating in the new round include Morgan Stanley (MS), VantagePoint Venture Partners, Draper Fisher Jurvetson and DBL Investors. Another new BrightSource investor is Norweigan oil and gas behemoth StatoilHydro (STO). Apparently, even Big Oil has seen the light when it comes to hedging its bets with green energy. PASADENA, Calif. — Solar power plant builder eSolar has raised $130 million from Google’s philanthropic arm, Google.org, and other investors. That was the headline news that eSolar chairman and Idealab founder Bill Gross slipped to Green Wombat during dinner Sunday night as Fortune’s Brainstorm Green conference kicked off in Pasadena. The other investors include Idealab and Oak Investment Partners. Big numbers grab attention but the far more interesting angle is the technology that eSolar is developing. If it lives up to its claims, eSolar could help break the logjam that has put Big Solar on the slow track in California. “We just completed tests at our test site this week and we will be able to produce electricity that is competitive with coal,” said an animated Gross Sunday evening. eSolar has been operating in stealth mode but Gross shared details of the company’s technology and how it intends to produce greenhouse gas-free electricity so cheaply — a claim sure to be met with some skepticism by competitors like Ausra, BrightSource Energy and Solel. At first glance, there doesn’t seem much radically different about an eSolar solar thermal power plant — it’ll use fields of mirrors to focus the sun’s rays on a tower containing a water-filled boiler. The resulting heat will create steam that will drive an electricity-generating turbine. The tipping-point innovation, according to Gross, is the mirrors and the software that controls them as well as the modular design of the power plants. While Oakland, Calif.-based BrightSource is developing a similar system, Gross says eSolar is able to use smaller mirrors — called heliostats — that can be cheaply mass produced from off-the-shelf glass like that used in bathroom mirrors. 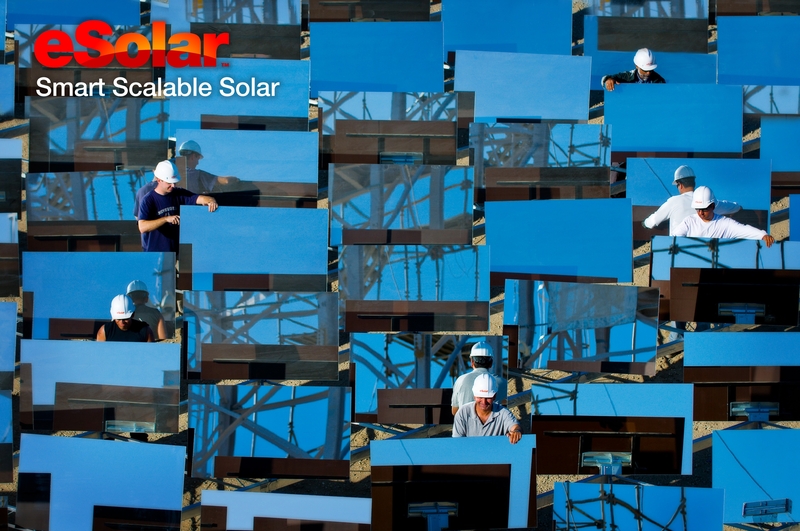 Proprietary software developed by eSolar controls each sun-tracking mirror, increasing their efficiency to produce more electricity. “It’s all about the software,” Gross said. Smaller more powerful solar fields means that eSolar can build power plants on far less land than competitors for less money, according to Gross. For instance, a 500-megawatt solar power plant can cost more than $1 billion to build and requires thousands of acres of land — which is why most will built in remote deserts. But eSolar plans to build modular, 33-megawatt power plants that can be constructed on a couple hundred acres and plugged into existing transmission lines near urban areas. “We’ve already bought up rights to enough land to produce more than a gigawatt of electricity,” said Gross, showing Green Wombat a map of California polk-a-dotted with the locations of potential eSolar power plants. A gigawatt can power about 750,000 homes. The small size of each power plant has another benefit — solar thermal power stations under 50 megawatts do not have to be licensed by the California Energy Commission. That means eSolar can cut at least a year or two off the process of getting a solar power plant online. That will certainly be attractive to the Golden State’s big utilities — PG&E (PCG), Southern California Edison (EIX) and San Diego Gas & Electric (SRE) — which face a mandate to obtain 20 percent of their electricity from renewable sources by 2010 and 33 percent by 2020. Although all those utilities have signed massive megawatt deals with solar energy companies, no plant has been yet built. Gross says that while eSolar has been talking to the utilities it’s not going to wait to have a power purchase agreement in hand before building its first plant.